Four men are in celebration mode after winning $1 million in the Lotto Max Maxmillion draw. One of the lucky winners is Daniel Wilcox of Barrie who scored the winning ticket from a Becker’s store in Scarborough. The 26-year old was initially shocked by his big win, but has since recovered to celebrate with ice cream. His other plans include buying a motorcycle and a house. Richard Brancati is the winner from Wasaga Beach. He was only enticed to buy a ticket after hearing people talking about Lotto Max. With his prize he plans to open a restaurant, buy a new car, and help his children with college tuition. 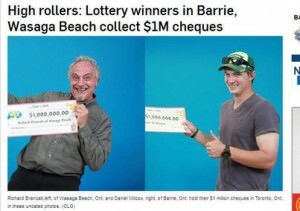 The two other million dollar winners are from Orillia and Owen Sound.